Finally others are mentioning the excessive heat coming off the right side off 2017 GSA. Very uncomfortable when just wearing jeans or if I go casual low top tennis shoes with low cut socks. I find that my right ankle's very uncomfortable to the point of toasting. This is not only during 100+ degrees in the summertime. I have felt this during winter. I mentioned this to dealer a couple of weeks after getting bike. If they have heard others complaining about heat on right side. I was told "NO haven't heard anything about it" really strange because it was so obvious. I installed the exhaust extension from Tom Dowell at Excell Throttle Control. Reduced the temperature of the right pannier from too hot to touch to just pretty warm. Beautifully-made piece of gear, by the way ($120.00). What is this? Excuse me , but I never heard this term before. Assume you are talking about the engine guard. You mean that little bit of plastic that is behind the rear wheel? Or are you talking about the plastic that protects the lower shock? My 2018 cooks my right foot, I don't feel it on my leg so much as I'm wearing a high boot, (Sidi Gore Tex 2 Adventure). What helps me while on the highway, is I position the heels of my feet on the outside edges of the foot peg and open my legs wide. The air rushing past my boots seems to extract the hot damp air from inside my boots, cooling my feet down quickly. I'm then able to reposition on the pegs and carry on for some time before having the need to do this again. I have had a MudsligMax installed since new so I have removed it to see if this changes the air flow on around the exhaust. I remember when i worked for a suzuki shop and the GSXR's came with a tire hugger at the front of the rear tire. Suzuki said that if it is removed it caused more heat to remain around the engine area. so we will see. I live in northwest Phoenix, AZ and removed Friday. Rode 100 mi on Sat morning to Yarnell and back. No improvement at all , so I put Possum Scraper back on. So far, it seems to help quite a bit. I'll be doing the Mid-Atlantic BDR in a few weeks and that should really test the shield. Last edited by mikec; 08-Sep-2018 at 05:59 PM (957). I have the heat problem too. Glad others are talking about it and sharing solutions. Is this the "possum scraper" at the rear of the bike or is it the mud protector in front of the rear tire? I am a little concerned about removing the one in front of the rear tire as it will eliminate protection for the bike. This extension does channel hot air toward the right side of the motorcycle. 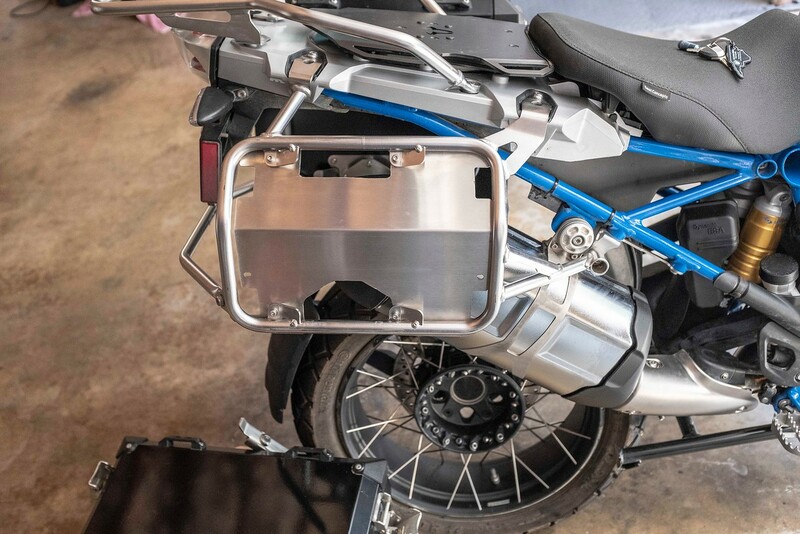 It aids in protecting the rear suspension as well as keeping road/trail debris off of the rider's lower left leg. I'm preparing for a BDR ride and will, in all probability, will remove my Mudsling. kramdunc and Clark2262 like this.